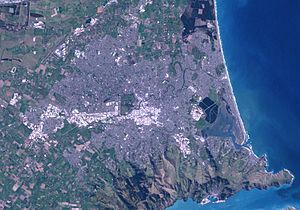 CHRISTCHURCH, New Zealand – New Zealand’s prime minister warned Monday that the country’s economic recovery will be hurt by the weekend’s powerful 7.1-magnitude earthquake that smashed buildings and wrecked roads and rail lines in the city of Christchurch. The aftereffects of the temblor are still coming to light. Residents in a new subdivision in a southern suburb were evacuated Monday from their houses, which became mired in deep layers of silt that spewed from the soft ground as it turned to liquid under pressure from the quake. Mounds of sand covered front lawns and driveways, and some houses had been ripped from their foundations. A driveway that had sloped upward from the road was now flat, the rose garden buried in sand. Army troops have taken control of central Christchurch to help police secure streets and badly damaged businesses in the worst-hit center of the city. The area remained cordoned off and under nighttime curfew, with only building and business owners allowed access. “There will be considerable disruption to the (regional) and national economy in the short term,” but activity should pick up as reconstruction gains momentum, Prime Minister John Key said. The country’s economy has now recorded two quarters of minor growth after struggling to escape 18 months of recession. The quake struck at 4:35 a.m. Saturday near the South Island city of 400,000 people, ripping open a new fault line in the earth’s surface, destroying hundreds of buildings and cutting power to the region. No one was killed, and only two serious injuries were reported. Key, who toured the city’s damaged areas over the weekend, said 430 houses and another 70 buildings, many of them older structures, were already earmarked for demolition because of damage caused by the quake. Around 100,000 of the region’s 160,000 homes had sustained some damage, he said. A quake-damaged building partially collapsed into a suburban street Monday and officials took urgent steps to bulldoze and remove it. There were no injuries reported. “Police had a unit going past just as it happened and they managed to stop and block (off) the road,” Inspector John Price said. The government plans to pay at least 90 percent of the hundreds of millions of dollars needed to rebuild thecity’s water, waste water and road infrastructure, Key said. Economists agreed the immediate economic outlook for quake-ravaged Christchurch is bleak, but noted reconstruction would provide a boost to a struggling construction sector next year. “I think people are going to be pretty conservative over the next three months. What we are seeing is … negative growth in the near term,” ANZ Bank chief economist Cameron Bagrie said. More than 80 aftershocks, ranging from magnitude 3.2 to 5.4, have rocked the region since the major quake Saturday. Rain was falling Monday in the nearby Southern Alps and foothills, increasing the risk of flooding. Civil defenseofficials warned that stop banks, or flood protectors, weakened by the quake may fail to hold rising waters. Engineers were inspecting the banks Monday. Around 150 people have been evacuated from a trailer park near the Waimakariri River as a precaution. New Zealand sits above an area where two tectonic plates collide. The country records more than 14,000 earthquakes a year — but only about 150 are felt by residents. Fewer than 10 a year do any damage. New Zealand’s last major earthquake registered magnitude 7.8 and hit South Island’s Fiordland region on July 16, 2009, moving the southern tip of the country 12 inches (30 centimeters) closer to Australia. Associated Press Writer Ray Lilley in Wellington contributed to this report. This entry was posted on September 6, 2010 at 4:19 PM	and is filed under Earth Changes. Tagged: Christchurch, Earthquake, Fault (geology), New Zealand, Oceania, South Island. You can follow any responses to this entry through the RSS 2.0 feed. Both comments and pings are currently closed.